Describe when Salesforce releases new features and enhancements. Find the latest information about a feature. At Salesforce, we’re proud to seamlessly deliver over 150 innovative features to you three times a year during our seasonal releases: Spring, Summer, and Winter. Now, you might be reading that and thinking, innovation three times a year—how can I possibly keep up? Then again, you might also be reading that and thinking, what happened to Autumn? Either way, rest assured, that’s why we made this badge. We’ll walk you through three exciting features per cloud that we have in store for you with the latest releases. If you’re interested in a feature, it’s important to check out the additional resources so you know all the details. This and the release-specific modules in this trail are designed to help you prepare for each release. The best place to learn about new features, important notes, how to set things up, or to prepare for Salesforce certification (wow, rad!) is to check out these additional resources, especially the Release Notes. Trailhead is a great way to prepare others for each release. Simply send this trail to all your stakeholders or users. They learn what it takes to prepare for a release, and they get a quick overview of the best that each cloud has to offer. So what’s in store for this release to delight your inner Salesforce geek? Check out the specific release modules included in this trail to see how Salesforce strikes again with a fresh batch of smart, agile solutions for making lasting 1:1 connections with your customers. Plus really rev up your business engines with the new, shiny features in Sales Cloud, Service Cloud, Community Cloud, Marketing Cloud, Analytics Cloud, and theSalesforce Platform. Talk about customer success catnip. Meow. Salesforce is always innovating. But more than that, we’re also always listening to you. Yes, we mean you. Through our IdeaExchange, hosted on our incredible Trailblazer Community, we’re able to stay closer than ever to our customers and community at large. Using the IdeaExchange, you can post your feedback, suggest new features, communicate with product managers, and vote for your favorite ideas. With each release, we include features from ideas posted on the IdeaExchange. That’s your feedback in action, helping us make a better product for everyone. In the next unit, we’ll take you through best practices for how to prepare for all the innovation that Salesforce is cooking up. We’ll walk you through developing a release strategy to implement all the new features you’ll learn about in each release module. Here’s a sneak peek. Don’t fret, it’ll all make more sense later. Excited about the next release? Us too. This release, we’re blazing forward into Lightning and we want you with us! Most of the features we’ll discuss are built for Lightning Experience. Like most experiences, Lightning Experience is best when you’re well prepared. So before we take a look at our new features, let’s talk about how to get ready. We've added more ways to assess your preparedness for Lightning Experience with the Lightning Readiness Check. Now you can assess your AppExchange packages and more of your related lists. We're also offering more support for developing your rollout strategy, by providing feature usage details and access to free consultations with Lightning Experience experts. The Lightning Readiness Check evaluates key features and configurations to build a custom Readiness Report for your org. The report highlights areas that need your attention before you make the switch to Lightning. Access the Lightning Readiness Check from the Lightning Experience (1) menu in Setup. On the page, click evaluate (2) to set the tool in motion. Once the evaluation is complete, you’ll receive an email with your report. The report includes specific recommendations for you and your company. Use this information to create a Lightning Experience rollout plan. In addition to the readiness check, we’re offering online consultations with Lightning Experience experts. Schedule a call with one of our experts to review your report and get answers to your questions about how to get Lightning ready. Click the link in your Lightning Readiness Report to set up an appointment. We also have lots of information about Lightning Experience right here on Trailhead. 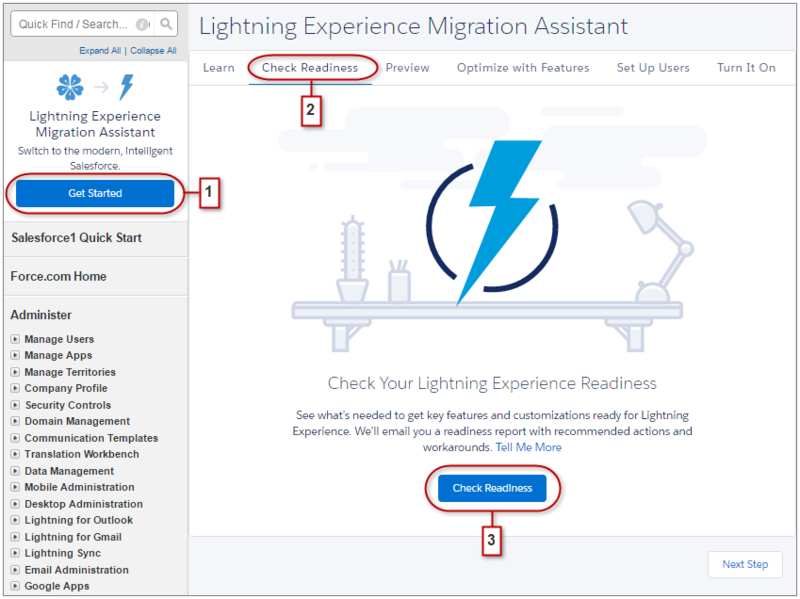 If you’re just starting to think about migrating, check out the Lightning Experience Rollout module. Or, if you’re just looking for more information about Lightning, head over to Lightning Experience Features. If you want more information about migrating to Lightning Experience, check out this four-part video series.